The Errigle Inn is a 1930's Belfast pub. The Errigle is excellent for a friday night out,friendly staff,patrons of varying age groups,relaxed atmosphere though would benefit from music being less muted downstairs in the main bar. Have you got Google Earth on your computer? If so, then download the Google Earth view of The Errigle Inn. Is this the wrong position for The Errigle Inn? If you think so, then modify its position. Click / Tap the button above to get directions from where you are to The Errigle Inn. was in over christmas hadnt been in the place 4 while,new bouncers and staff in bar,used to be 2 guys on front door that were good laugh,dont think ill be back. was lured in by the stuuning xmas lights then realised we were paying the leccie bill with the price of the beer!! Had a great meal before the match, then we came back for a few drinks after. We live in Hollywood, the trip was worth it. This bar is has character and charm. Was in last Sat night to see 'Bad Wind' a crackin' rock band!! A great night just like the old days back at the errigle. I was in on Friday night and it was fantastic. It was packed and I still managed to get drinks without waiting too long. The talent, the decor and the food were all first class!! Would definately reccoment it to my family and friends. See you soon Errigle!! The bar is good and friendly. The service is quick and the staff still can find time to chat. The door staff are helpfull and friendly to but, stand no nonsense which makes me for one feel secure and able to enjoy my night. great place but what about a traditional band some time? Best Bar in Belfast! The right crowd and an amazing atmosphere. It is a little more expensive than its competitors but definately worth it!!!!! On a Friday night it is the place to be, extremely busy but with good service you don't have to wait long. The food is amazing and its always a big hit when they bring out the BBQ. We will be back for sure!! I was annoyed to read a few poor reviews about the Errigle as i've been drinking there for years and have never had a complaint about it. I'll admit that's it bit more expensive than it's competitors but its always buzzing (unlike the other bars on the road) and has staff that will actually talk to you. it's worth it. The Errigle Inn is the Best Run Public House in Belfast. There is never any trouble, the customers and staff are great. (Not to mention service etc) They are very strict, if you mis-behave forget about coming back, you wont be welcome. There are very few bars of this quality in Belfast. Keep up the good work Mr Errigle!!!!! 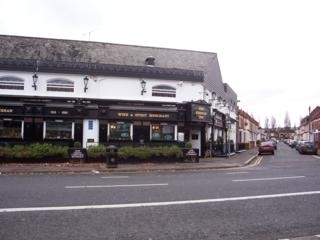 i love the errigle, cant drink in the local cus i work there so i use the errigle, its great to meet up at for a few drinks with mates, also a nice place to pop in for food in the afternoon, barstaff friendly and a nice atmosphere. possibly my favourite place for a drink in belfast. Crackin local bar! A busy bar with drink prices that will worry your bank manager (and the beer is always warm????) then again all the pubs around it are way too expensive.Having said that it is much better than the Pavillion though that wouldn't be too hard. Food is OK but again way overpriced. As already mentioned it's the smokiest bar in Belfast and i'm a smoker! I always have a great time in the Errigle. I do not know of any other bar that has so much tradition and atmosphere. 5 different bars under one roof!!!! I am mainly a Corona drinker and its always ice cold!!! You must try the food, its better than most top class restaurants!!! The right atmosphere, location and pub. Word about town is that its the New Mature Better Bot!!! Keep up the good work!!!!!!!!! One of Belfast's best bars. Always good craic and plenty of entertainment. Best Guinness in town. Really smokey bar bring on the smoking ban, my clothes stink everytime I go into this bar even for 5 minutes! The back bar in the Errigle is one of my favourite bars in Belfast. A very mixed crowd, nice 1930's decor and no music - no designer nonesense here! I only hope it stays as it is. I almost afraid to recommend it in case any others are inclined to give it a try. if you are only going out to be seen or heard try The Mercury instead. a great unpretentious bar with good food, good music, good venues and usually good customers. often has gigs upstairs as well as a 'quiet man' bar in the back, as well as regular monday night pub quizes. only possible failing is at the weekends it is so popular you may have trouble getting a pint!